You might associate heat rash with babies. But warmer temps put active kids at a higher risk for developing heat rash, too. Find out what you need to know about preventing and treating heat rash, or “prickly heat” as it’s sometimes called. You might associate heat rash with babies. But sticky high temps put active kids at a higher risk for developing heat rash, too. When it’s hot outside, there’s a higher risk of heat rash in children who are highly active, overdressed for the weather, or wearing clothes that don’t allow the skin to breathe. These can increase the amount of sweat on a child’s skin, which increases the chance for a heat rash to develop. Excessive sweating can cause a child’s pores — which are actually sweat gland ducts — to become blocked, and perspiration can become trapped underneath the skin. 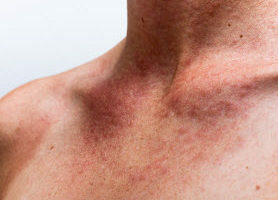 This can result in irritation, redness and the sometimes itchy rash, known as heat rash. A heat rash may look like tiny bumps surrounded by red skin. Some forms of heat rash can be itchy or cause a prickly sensation. A heat rash is typically not painful. In infants, the rash usually develops on the neck, armpits, elbow creases and groin. In older children, it can also occur on the chest and back. The rash does not typically involve the eyes, nose, mouth, palms or soles. If your child develops a heat rash, you can expect that he or she will act normally. A child with a heat rash should not have fever or other signs of illness. If you suspect your child has a heat rash, you should start the cool-down process right away. Immediately get your child out of the heat and into a cooler area. You may also try to cool your child off with a fan. Remove any extra clothing that your child may be wearing, and loosen it. There is no need to use any lotions, oils, creams or ointments on the skin, as this could further block the pores, trap moisture and make the heat rash worse. Remember to dress your child in a breathable fabric, such as cotton, which allows the air to circulate and allows the sweat to evaporate. This will keep your child’s skin cool and dry, and it will help treat and prevent heat rash. Heat rash typically clears up in a few days and leaves no permanent damage to the skin. Be sure to call your pediatrician if the heat rash persists, does not improve in a few days or seems to get worse. Also, seek medical care if your child has fever, is acting sick or has any other symptoms. What’s Really Causing Your Baby’s Diaper Rash?